She wrote this super insightful post about Hashimoto’s Thyroiditis awareness. Please welcome Gena McCown to the blog this week. If you are reading this, it’s because you ARE or you LOVE my people, those of us who suffer from a thyroid disorder. My specific disease is Hashimoto’s Thyroiditis. And I am taking back my life, one step at a time. Some people who have thyroid disease, have a simple explanation… their thyroid is working too hard or not hard enough. They take medication daily to manage it. Others may have NO thyroid at all because of cancer or by removing the thyroid to manage the symptoms better. These people also take medication daily to manage it, but at a higher dose because there is no thyroid function at all. Then there are people like me, who have an Autoimmune based thyroid disease. This basically means that my body is actively trying to KILL my thyroid. Some days, it is a more brutal assault than others. Unlike other thyroid diseases, I can swing between being HYPER (too much) and HYPO (too little) thyroid from day to day. I am given the same medications as other thyroid conditions because honestly, modern medicine has no clue how to treat my disease. They treat the thyroid the best they can but ignore the autoimmune aspect. In the years since I have been diagnosed I learned a hard, cold, truth. Hashimotos Patients and their symptoms are like snowflakes. There are no two alike. My sister and I, both have the disease and our symptoms are VERY different. I chose the image above, because it’s a good start. Hashimotos sufferers will fluctuate between hyper and hypo, so you can have symptoms that fall on either side, or both of that graphic. Additionally, it is becoming more recognized that once you have an auto-immune disorder, you are more likely to develop MORE AI diseases over your life time. What Are the Biggest Obstacles for Someone with Hashimoto’s? Lack of Adequate Medical Care – due to the general lack of information and research on our disease, most Hashimoto’s patients are receiving sub-par care. Doctors will look at our blood work results, adjust our medication, and send us on our way. They do not look at the root cause, the autoimmune disorder. Unfortunately, most of the doctors that will are not covered by insurance. This puts many Hashi’s patients at a disadvantage for getting proper care. This Disease is, in Many Ways, Totally Out of My Control – many Hashi’s patients will suffer from symptoms that come and go as they please, which can lead to us canceling plans last minute because we are having a flare-up. Other symptoms stick to us like glue and are at times an impossible hurdle to overcome, like our weight or fatigue. The medications that are currently on the market are not curing us, and often not even making us remarkably better. They are really just helping us get by from day to day. This Disease is Invisible, Which Means We Get Judged A LOT – by family members, friends, coworkers, and even health professionals. You would be amazed at the cruel things people will say to us because they lack any understanding of what we go through. We get accused of cheating on our diets or mocked for changing our diets, accused of being lazy, making excuses, blah blah blah. These judgments hurt us to our core because see number 2. This Disease Affects My Entire Body – head to toe, it is apart of my everyday life and nothing is left untouched. Hashimoto’s will affect your mental faculties, your hair may fall out, you will have issues with your dental health including bone loss in your jaw, you will experience swelling and discomfort in your neck, heart palpitations, your body will swell and diuretics won’t stop it, you will most likely suffer from some sort of food sensitivity, your libido will decrease, your muscles will ache, your skin will hurt to be touched, you may end up with balance and coordination issues, it can impact fertility, and the list goes on and on. In fact, there are over 300 possible symptoms and no two Hashimoto’s patients are alike. What Are We Learning About Treatment? Integrative, Functional, and Holistic Doctors seem to have the best approach because they look at the whole body. However, most insurance companies do not cover these doctors leaving patients to foot the bill. I have been fortunate that our insurance covers my doctor. We need to ensure the proper blood work is being done which includes testing for thyroid antibodies, food allergies, vitamin and mineral deficiencies, hormonal changes, adrenal fatigue, and other autoimmune disorders. Every patient will be different in regards to the severity of disease, deficiencies, food allergies, symptoms, etc. Thus our treatment will differ from each other, and this is figured out one step at a time. Often we are throwing things at it, simply to see what sticks. Therefore patience through the healing process is imperative. Exercise affects our body differently, high-intensity workouts can actually be detrimental to our weight loss because it puts our body under stress, which increases our cortisol levels, which affects our thyroid function. Most Hashimotos (and autoimmune sufferers) will have LEAKY GUT and repairing the balance and health to your gut will help you feel better. This often involves the removal of gluten, sugar, dairy and sometimes soy, corn for at least a year. Your doctor (and your body) will help you know when you have healed. Additionally, the addition of certain probiotics will help the process move along faster, including the addition of lacto-fermented foods to help with inflammation (sauerkraut, kimchi). Currently, I am seeing an INTEGRATIVE DOCTOR. Under her care, we are addressing my Hashimotos from a whole body approach. We are not just treating my thyroid, but also addressing the autoimmune component. She is covered under my insurance, although my co-pay is a smidge higher than my primary. Since every patient is different, just because this protocol is working for ME… it doesn’t mean it will work for you. So please be sure to work through your condition with your doctor. You are welcome to share my protocol with your doctor to discuss if any of these suggestions will be beneficial for you. Please also note, that all of the following have been discussed with my integrative and are under her monitoring. Gluten Free, Dairy Free, Sugar-Free diet. *Radiance Brand is gluten free, preservative free, sugar-free, dairy free, artificial color/flavor free, salt-free. * There is some crossing of supplements…. my Multi V, D3, and Calcium all have D3. Since I am supposed to get 5000IU daily, between these 3 I get as close to that number as possible without going over. Same with Selenium, it’s in both the Selenium supplement and in my Multi V. However, combined I do not exceed the dosage amount my doctor desires. Blood tests included thyroid levels, food allergies, vitamin/mineral levels, etc. I am adding in iodized salt, b/c my iodine levels are the cusp of being too low. Magnesium: I currently use Jordan Essentials Magnesium Lotion and Magnesium Soak. JE Products are all natural, family friendly, and gluten-free. Root Cause suggested that acupuncture works for some Hashimoto’s sufferers. I tried it for a few months, and I didn’t notice any improvements. I’ve decided to delay further acupuncture treatments at this time. For when I travel and may not have access to Kefir Water or Kombucha, I’m going to purchase Food Science Mega Probiotic-ND. This year we are also looking into whether or not I am salt sensitive which could be having a huge impact on my weight. God blessed me with a divine appointment by seating me next to two women who both suffer from thyroid disorders. Each of us in a different stage of our fight to beat this disease. The woman who was ahead of me, and able to shed a lot of her weight utilized “The Waterfall Diet” written by Linda Lazarides. It is a book on how to control your water retention… swelling… and shed that water weight. It’s a diet that is not lifelong, but rather a process of eliminating to their diet, with slow introductions over time. I’m only a few chapters in, and I am checking off all of the signs and symptoms of water retention, and it even mentions in the book thyroid conditions causing water retention. Unfortunately, if you are following the rules… you must read the book and not start the diet until you get to the end. So, I have no results to share yet. These are not affiliate links, I do not make money off of their sale. I like to give visual references to help with shopping and direct links when possible. I hope you found Gena’s post helpful. This is a resource, but you should not use the information on this website for diagnosing or treating any condition. This intended for informational purposes and is not meant to substitute for the advice provided by your physician. If you battle chronic illness, I know it can be a long weary battle. But remember you are never alone. God is always with you, He loves and cares for you, and He’ll be there to see you through. Gena McCown lives a full life while loving and serving her family and women leaders despite battling chronic illness. Gena’s passion is equipping women for Kingdom work through the local church, writings, speaking engagements, and teaching opportunities. She is the founder of the Women’s Ministry Council where she equips women leaders to bless their homes, churches, and communities. I met Haley Isbell and we talk about how she kept her faith through a Stage 4 Breast Cancer diagnosis. On the By His Grace, she talks about the importance of keeping our faith in the midst of the battle. In December of 2016, Haley was diagnosed with Stage 4 metastatic breast cancer which has colored her life with a beautiful appreciation that most people don’t get to experience. Her faith and trust in Jesus Christ through adversity will inspire you! Haley is from Alabama, and she is the proud wife of six years to her chicken farming husband, Bobby. They have a three-year-old daughter, Presley, and a one-year-old son, Knox. Haley’s story was featured in the Birmingham City Mom’s Blog, and she is sharing it with us here today. Haley Isbell and I talk discuss going through Stage 4 Breast Cancer. She talks about the importance of keeping our faith. And that God positions us in circumstances so we can be a blessing to others. In December of 2016, Haley was diagnosed with Stage 4 metastatic breast cancer which has colored her life with a beautiful appreciation that most people don’t get to experience. Her faith and trust in Jesus Christ through adversity will inspire you! Haley is the proud wife of six years to her chicken farming husband, Bobby. They have a three-year-old daughter, Presley, and a one-year-old son, Knox. 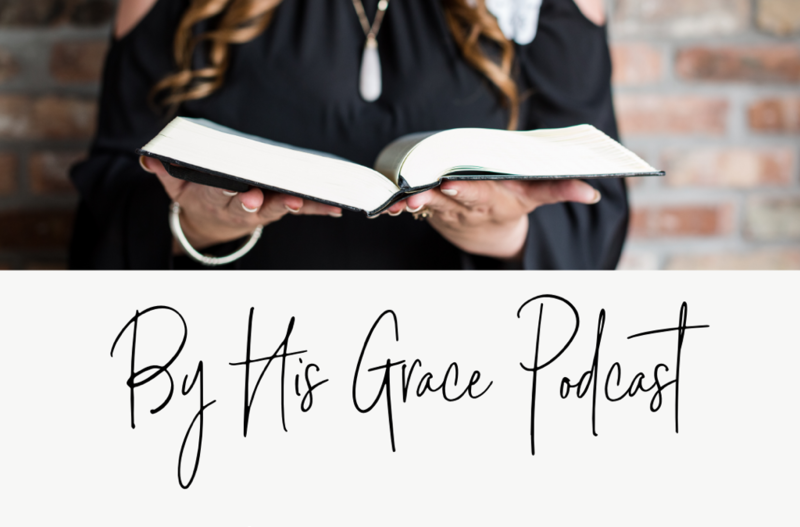 When I met this week’s By His Grace Podcast guest Tricia Thirey, she radiated Jesus. Tricia Thirey is a young widow and mom to three children six and under. In 2013 her husband Ben was diagnosed with brain cancer and underwent his first surgery. He retired from the military in 2016 and they moved back to Ohio to be near family where he began his third battle with brain cancer. He passed away in the summer of 2017. Since his passing Tricia shares many life lessons of love and loss with others. She enjoys sharing her journey and all that God is teaching her with others on her blog. Today Tricia shares wisdom about not being afraid and knowing you are not alone. I am thankful that God has sent those people into my life this past year to fill the void left by losing Ben. While it will never be the same as having him here, I appreciate their willingness to listen, their attempts to relate, and they are loving me through whatever the struggle was. And most importantly, their praying for me to find peace in the midst of whatever that struggle was. Even on the days when it feels like no one understands, no one can relate, and no one feels my pain. There is a heavenly Father who is right there, understanding, relating and who lifts me back up so that I know I can continue to make it through. And I am grateful for those friends who have surrounded me this year and have pushed me to remember that even when they are not with me, HE is. And He will never leave me alone. Isn’t it so comforting to know we are never alone! God is always with us and he is always there to see us through our difficulties. We only have to call upon his name. My friend, I don’t know where you are right now, or what you are going through, but I want you to know that God sees you in the midst of your struggle. He loves you and He will never leave you or forsake you! All you have to do is call upon His name.